Jean Shin is a master of rendering small objects on a monumental scale. The everyday becomes epic. Her works in The Collaborative Print: Works from SOLO Impression, on view through September 13, aptly convey the grandeur of her quotidian forms. Born in Seoul in 1971, Shin currently lives and works in New York City. She earned a B.F.A. and a M.A. from Pratt Institute, while her studies have also taken her to the prestigious Skowhegan School of Painting and Sculpture in Maine. Notable honors have included a Biennial Art Award from the Louis Comfort Tiffany Foundation in 2001 and a grant from the National Endowment for the Arts in 2004. Washington, DC has often been a welcoming city for her art. 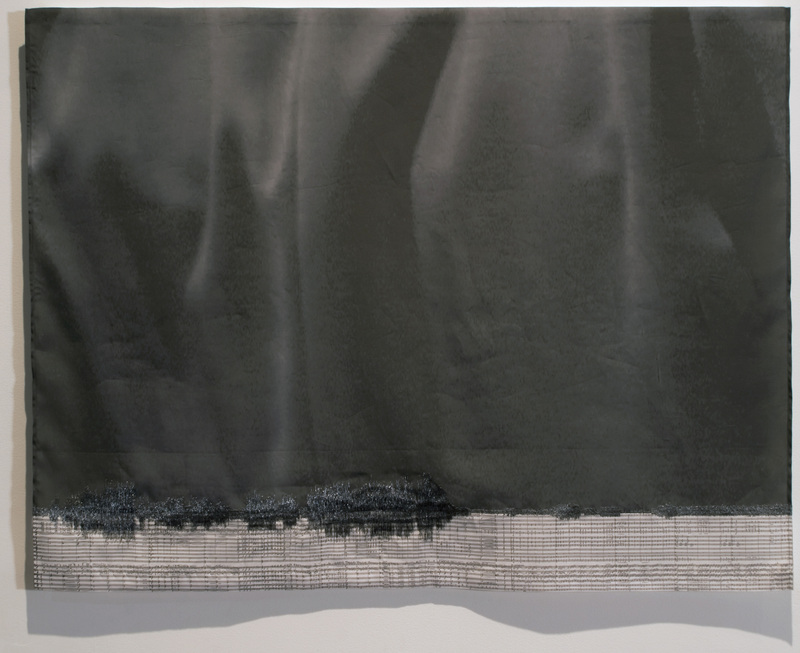 Last summer, Jean Shin: Common Threads at the Smithsonian American Art Museum was her first solo museum exhibition, while the earliest exhibition of her work, Presidential Scholars in the Visual Arts in 1990, was also at SAAM. Best known for her sculptural installations that explore the theme of community, even large public projects speak to issues of personal and collective identity. A work like Celadon Remnants, 2008, exemplifies these tendencies. First, Shin begins with a collector’s spirit, searching out items commonly conceived as useless. For this project, a mosaic installation at the LIRR Broadway Station in Queens, New York, those otherwise rejected objects were fragments of traditional Korean pottery. These found treasures are then converted into designs that speak to both abstraction and realism. Here, the ceramic remnants were patterned into shapes evoking their original form of Celadon pottery. Yet what the viewer immediately perceives are undulating lines against a white background, shapes without antecedent. Located in a Korean-American community in Queens, the mosaic embraces the neighborhood’s heritage while also remaining accessible to a wider audience. Shin’s prints are intimately tied to her other works. The print Celadon Threads, 2008, on display in The Collaborative Print, is an obvious example. Created to refer to Celadon Remnants, the digital embroidery triptych is a hybrid of traditional forms with an innovative materiality. The ceramic silhouette again dominates, this time made with needle and thread, suggesting subdued domestic space instead of the hustle-and-bustle of an entire neighborhood. What the viewer witnesses with these two works is the dynamism between public and private and the common motifs that support both identities. The various elements of And We Move (Pause), 2008, also on view in The Collaborative Print, further illustrate the assemblage mentality that runs through all of Shin’s work. Seeking to illustrate via print-making the experience of listening to music performed live, the series of five prints combines three components of the same event. The blocks of black, made silky with moments of light and shadow, are the photographic stills of a conductor’s back as he leads an orchestra. The minute, finely detailed musical score is excerpted from Czech composer Bedrich Smetana’s Ma Vlast, while the precise embroidery mimics the sound waves of the performance. The communal spirit of listening to—and seeing—music fills the gallery, nurturing the public-private space that Shin so expertly explores. -Rebecca Park is editorial intern at the National Museum of Women in the Arts.